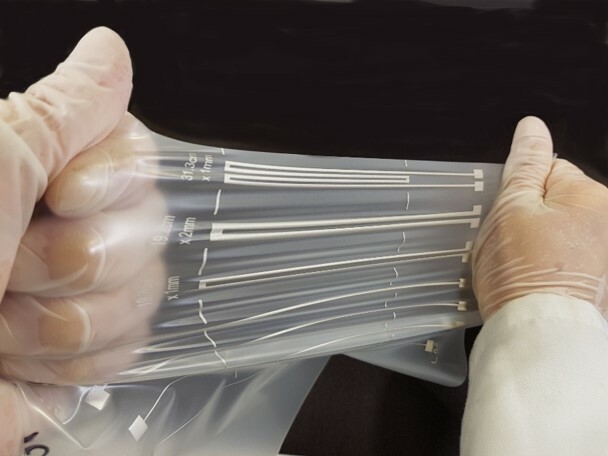 For applications where the already good flexibility of Inkron materials is not sufficient a new, stretchable, line of siloxane polymer materials has been developed. They are targeted especially at emerging technology areas like smart textiles and 3D embossed structures. Excellent results have been achieved printing on fabric making them a reliable choice for smart clothing applications. Negligible performance loss is found after embossing inks printed on polycarbonate foil. As solvent-free materials, a single printing pass suffices to reach full performance for both the conductive and the insulating materials. No more pinholes or incomplete coverage after one pass, reducing process time and material consumption. The silver-based inks (IPC-602, -602X, -603 and -603X) are the materials of choice when conductivity is the primary requirement. They come in four varieties, with different behaviour during stretching. IPC-630 has similar handling properties as IPC-602 silver inks but with a carbon filler: a lower cost material for when highest conductivity is not required. IPD-650 is a stretchable dielectric solvent-free ink with an oxide filler. Full insulation is maintained up to 60% stretching when tested between silver lines. 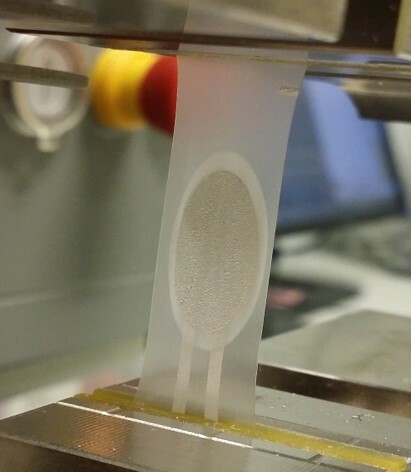 These new siloxane polymer-based stretchable inks give access to several cutting-edge platforms for new devices and manufacturing technologies. As these materials are all based on a siloxane polymer basematerial, compatibility is excellent: conductive and dielectric materials used in subsequent layers show very good adhesion, also after repeated heating cycles.